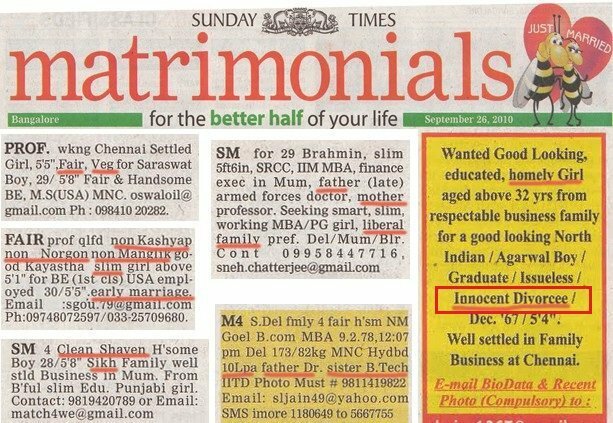 Hindu matrimonial advertisements are littered with “fair”, “very fair”, “tall”, “beautiful” and the like, but also with the bizarre “innocent divorcee” and ” clean shaven Sikh”. There are always enough clues to specify caste, if caste and sub-caste are not specifically named. Often the classified ads are classified by caste. 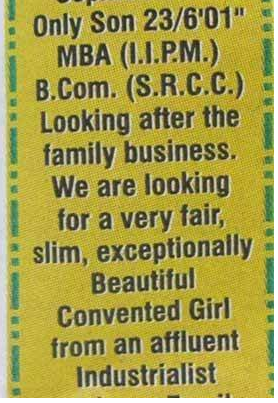 The ad can be very specific and require a “convented girl” (which is someone educated at an english-medium school originally started by nuns – a “convent”) like this one from a Brides Wanted classified. Five people were arrested today in connection with the assault on four Nigerian students yesterday, Noida police said, according to ANI. “Police have arrested 5 persons. FIR registered, action will be taken accordingly,”said Daljeet Chaudhary, assistant director general (law and order), to ANI. One of the assaulted students spoke to the media today. “We asked people around for help, but not one called the police. Even our college did not help,”the student said. Racism is not just endemic among Indian Hindus, it’s genetic. This entry was posted on March 28, 2017 at 10:15 am and is filed under Behaviour, Religion. You can follow any responses to this entry through the RSS 2.0 feed. Both comments and pings are currently closed.